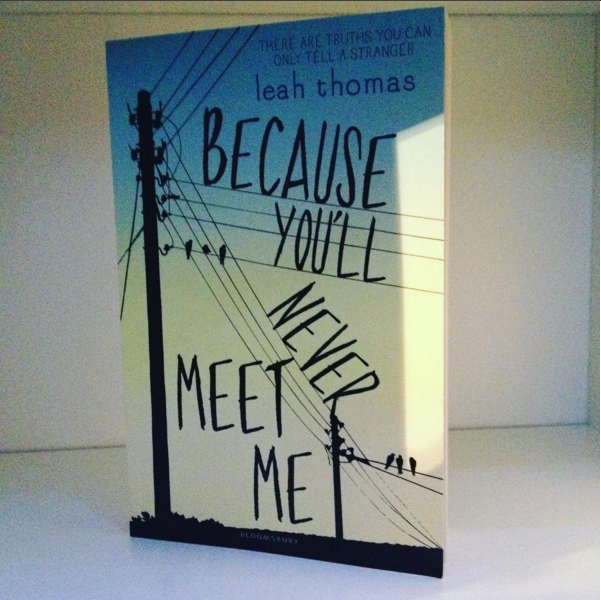 If you're looking for a story that'll be moving and close to reality then this is your next read: Because You'll Never Meet Me, a story of an impossible friendship and hope from a brilliant new writer Leah Thomas. Ollie UpandFree and Moritz have stolen my heart! The story is about two boys. A fourteen-year-old from Michigan and a sixteen-year-old from Germany. The two of them meet by a common friend, on the first sight you'd think so? But this isn't any ordinary friendship. Both boys are sick, Ollie UpandFree is allergic to Electricity while Moritz needs his electric pacemaker or he'll die. Which leads to the conclusion that both will never meet in person, will never touch each other and will never use words out loud to communicate. Even if they'd meet each other, one of them would kill the other. You Could Kill Me. The author of the book gives us a fierce bond in the making through handwritten letters. When Moritz tells him the key to their shared, disturbing past, their friendship is put to the test that neither of them expected. I can't underline enough that this book was absolutely stunning. This friendship that evolves just by handwritten letters, no internet, it's nothing like how we make friends nowadays. Above that their diseases make sure they can never ever meet but both of them don't even care about that. 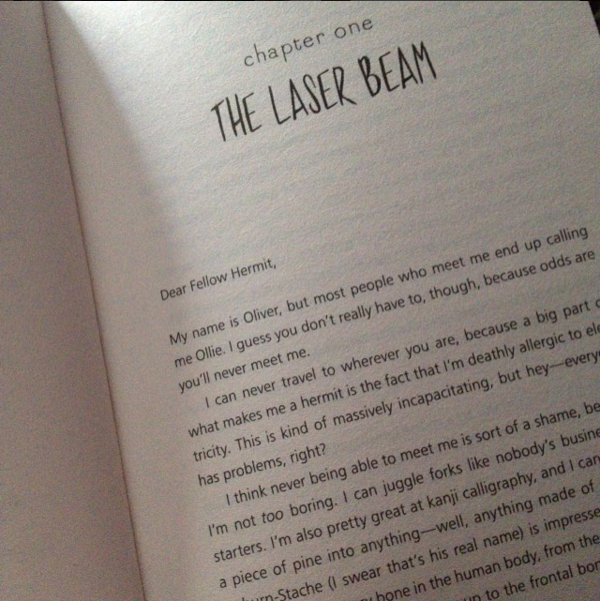 The book is build up with chapters, each chapter is a written letter by either Oliver or Moritz. And you'll know who is writing or speaking through words because the book uses a different fond for each letter. Oliver's letters are neat, simple and slim while Moritz his letters are thicker and really dark from color. I already loved it that the author chose to pick two different kinds of fond because it made things more clear and as if you actually had the letters in your hands. Reading their conversation. Oliver or as he calls himself Ollie Ollie UpandFree lives in the woods only because of his disease. He has never seen a television show, never heard music with an Ipod. He hasn't seen anything that we nowadays do have seen and get bored of because it's nothing new. Today, we live in a fast and technical generation, we want new stuff, new updates and very fast. This book only shows us that there are people out their who can't even witness it, who are locked up or are very sensitive to all our new technologies because of this allergy. The author might be showing a very worse case of it but does that matter? It made me, as a reader, stop and think about it for a while. Especially because he feels alone. He's out there in the woods with his mother with zero friends and only his Glockenspiel and a lot of books. Until she stopped coming. Ollie describes how he feels when he's waiting at the power line for her, wishing she'd arrived on her bike as always. He tells Moritz how he feels whenever she's around and how she made him change. How their friendship was made. Unfortunately, Liz doesn't come when he's waiting for her and that only breaks Ollie's heart. It hurts him so deep he locks himself into his room, writing to Moritz and telling him why she hasn't come around anymore. Moritz lives far away from Ollie with his own thoughts, own feelings and own big problems. In my opinion, we see him change the most in this book. 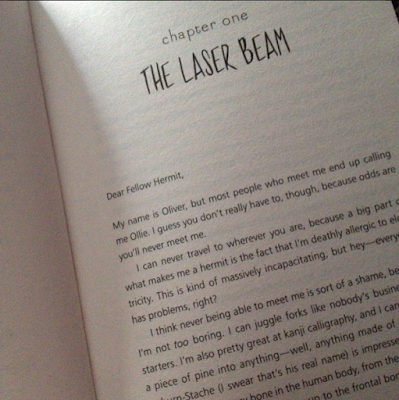 He tells Oliver what he thinks about Liz even if it's very blunt.He speaks up for himself and might be a little distant in the beginning of the book. He also says no to Oliver's nickname for him: Mo. I am no Oscar Wilde and no Mo. The thing with Moritz is that he's had a very hard past, one he's not very proud of and even scared of. And there's more then his disease, there are more secrets to tell. Throughout the book he'll reveal them and it'll surprise the reader very much. He tells them to Oliver because there are truths you can only tell a stranger but with those secrets a big test comes down onto their friendship. Both boys suffer from each their own personal problems and the other just really listens, even when it's through letters, both boys pull each other up. Ollie UpandFree by his energy, enthusiasm and optimism while Moritz tries to use Oliver's energy to get Oliver back on his feet or even by his wisdom. 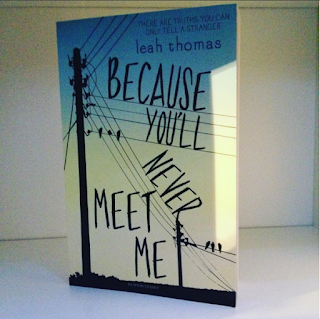 This book was so moving and emotional but stunning. Their friendship makes you want to long for something as fierce and strong as theirs. And all of that combined with the reality check you get. It really made me think about all the boys and girls that have these problems. That's when events started happening. Things I didn't see coming at all! This books just surprises you while you're already enjoying their friendship. But it also makes you a little bit scared and gives you a thousand questions! What's going on? Where is he? What's he doing? What does he mean? What's going to go down? It gives you that extra thrill to read even faster than you already did. Only to have more feels, more emotions at the end of the book. The ending was absolutely beautiful! I leaves room for your own imagination too and that's something I normally don't enjoy. I'm the kind of person that wants to know how it ends, how it really ends. This book on the other hand made me happy that their was room for that. I'd love to see a flash forward of this friendship but I doubt the writer will ever write something like that, it might ruin all the magic and impact this book has on the reader. This book deserves 5 stars out of 5. It has everything it needs to move the readers and at the same time, let them crave for more. If you want to read a book that's closer to reality, this is what you'll need. This friendship with all the human flaws is exactly you'll get. "There are truths you can only tell a stranger."